If you are looking to either buy or sell a horse, you've found the right place. With considerable experience, and the right contacts, Sophie's freelance horse agency is the service for you. The Horse Agency is a service for acquiring and selling event horses. 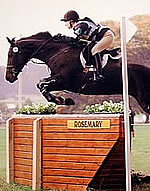 Agency work is undertaken on behalf of clients, the aim is to provide a quality event horse at the best possible price. The final price includes a 10% agency fee. Over the past 10 years Sophie has sourced horses for both UK and overseas clients, many of whom are now competing at International Three Day Events. Where Sophie excels, is in her ability to match a young event horse's potential with a rider's capability. She is particularly adept at spotting a youngster's potential before success puts its price beyond the reach of many people. Sophie always has a supply of quality horses and ponies for sale, all of which she has ridden, or taught and knows personally; so can offer an honest account of the horse or pony before being seen. Clients are generally very impressed with how Sophie matches the abilities and expectations. 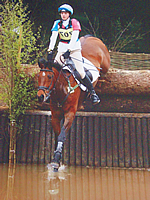 Iona Dent Competing at Hambledon, on Insync. The combination were selected for the Junior Europeans GB Squad 2008. Insync has now been sold to America through Sophie's Horse Agency. Marina Lawson Smith winning JRN Champs at Weston Park 2006 on Fancy That II, who has now been sold to Will Furlong through Sophie's Horse Agency.